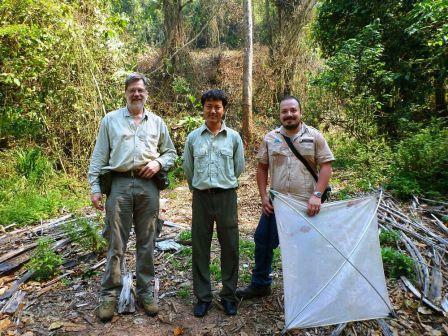 We rejoin our exploring entomologists who have again made contact from China, transmitting the next chapter in their weevil collecting travelogue from southern Yunnan. 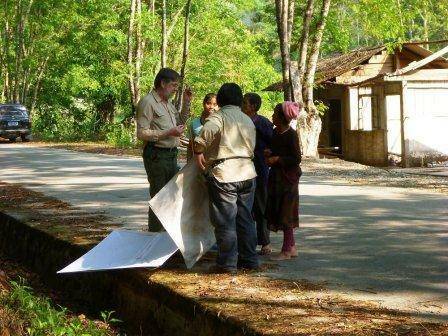 “We have spent the last week collecting at various sites in Xishuangbanna Prefecture. Initially we collected in rather dry forest areas with limited results, though with some interesting species found including a grey-coloured entiminine weevil that was often beaten from the tea plants in the many plantations in the region. Chris was able to observe the courting behaviour of a male as it tried (unsuccessfully!) to mate with a female (the male rather charmingly nibbling the back of the female’s head, although what was happening at the other end was somewhat less romantic). 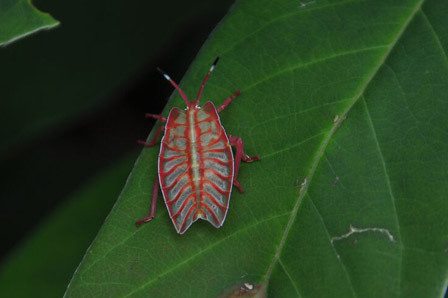 We suspect that this species may be a potential pest of the venerable leaves that make that quintessential Chinese and British drink! 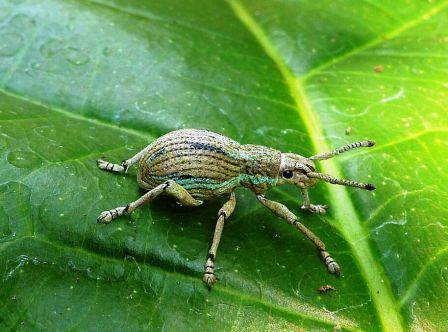 Now just imagine if tea plantations were to become heavily infested with this weevil and production of tea was negatively affected; heaven forbid the dire consequences that would result from the populance at large back home not being able to get its morning cuppa! Moving onto happier thoughts, we last left you soon after our arrival in the area around the Xishuangbanna tropical botanical gardens in Menglunzhen, after our trusty and knowledgeable local driver Yang Kun had driven us there, where beetle activity was picking up with the arrival of rains. 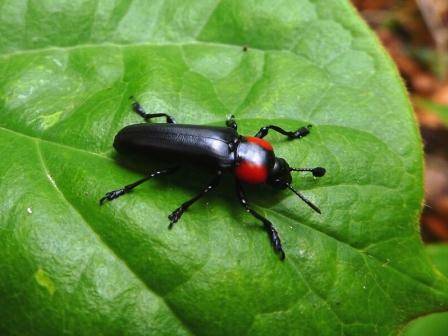 Often when collecting beetles, especially in unfamiliar areas, it takes some time to get one’s ‘eye in’ as to where best to look for them. 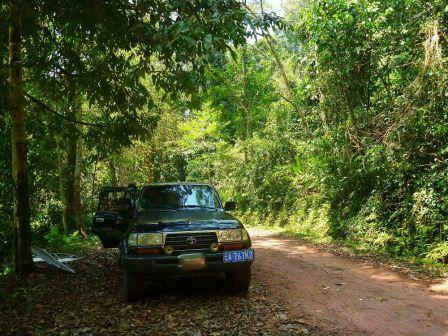 This seemed to be just the case in Yunnan, where we eventually realised that some of the most productive areas to look for weevils were in steep-sided, forested gullies with streams along their bottoms, running down mountainsides and accessible (in places) from the road. These gullies tended to be very humid compared to the surrounding forest, and to contain perse vegetation. 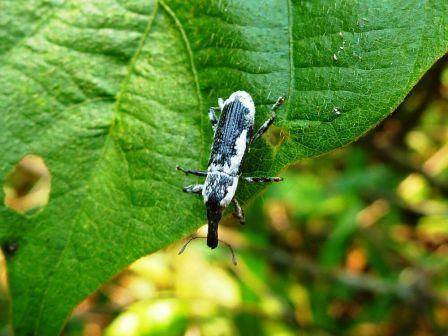 But finding the best places for weevils is only half the story; when to look for them is equally important. 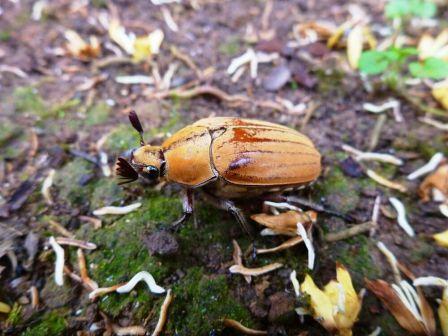 We noticed that in Yunnan, weevils are late risers. During the morning few are active, with activity gradually increasing to peak quite noticeably during the hottest part of the day. Therefore the most fruitful collecting was to be had between 13:00 and 16:00 hours when our beating sheets and sweep nets, whilst not quite groaning under the weight of chitin, nevertheless picked up the majority of each day’s catch. Of course this is precisely the time of day that is the most physically demanding, which combined with the near-saturated atmospheric humidity, left for some very sticky field shirts indeed! 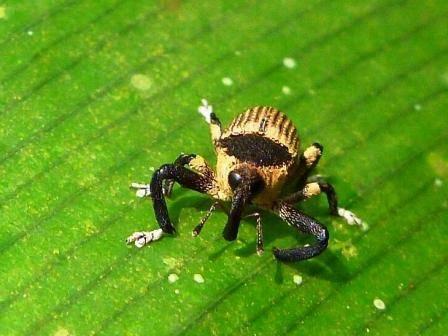 “Amongst the weevils collected during these days were a number of species belonging to the tribe Mecysolobini (subfamily Molytinae) and a species of wood-feeding Lobotrachelini (Conoderinae), both of which are new tribes for Conrad’s phylogeny. 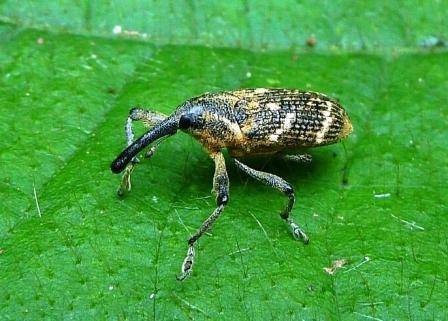 Also collected were a number of as-yet-unidentified sub-corticolous weevils belonging to the subfamilies Cossoninae, Scolytinae and Platypodinae, and the family Brentidae (straight-snouted weevils). 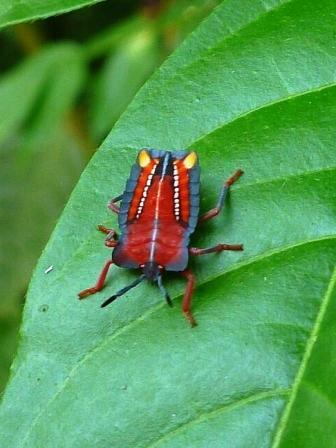 The last of which was represented by a couple of species including an inch-long attractively red-spotted one displaying marked sexual dimorphism; the females have a long, narrow rostrum and the males a short rostrum with robust mandibles. In this secretive world sandwiched between the bark and the wood of certain trees, Coleopteran life was flourishing. With each pull of the bark, this habitat seemed to be increasingly teeming with beetles, with all species highly adapted to their tightly confined home (not for the claustrophobic!). 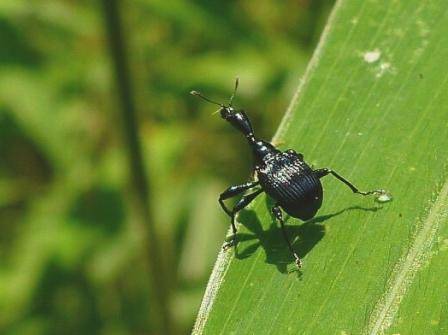 The beetles, from a wide variety of families including predacious rove beetles (Staphylinidae), ground beetles (Carabidae) and histers (Histeridae), to the vegetarian weevils, had reached a consensus. They (or more correctly their long-line of ancestors over thousands of years) had uniformly decided that it was a good idea to be as flat as pancakes! Sometimes evolution just jumps out at you. A pair of straight-snouted weevils (Brentidae), The female is above and the male is below. Back at the botanic gardens in the evening we checked the lights for any business, making sure to scan neighbouring vegetation and trees, on which many species prefer to alight rather than flying directly to the lights. 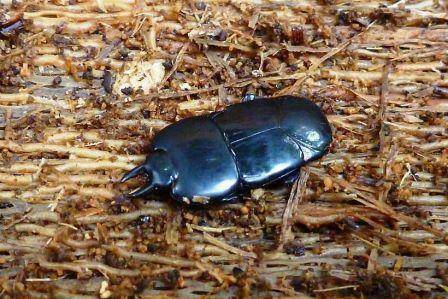 Several chafers were around, mostly belonging to the subfamily Melolonthinae, and one species looked decidedly familiar. 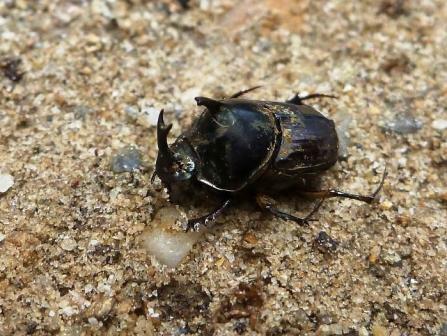 This was a member of the genus Melolontha, looking not unlike our very own cockchafer, M. melolontha from Europe which, incidentally, should shortly be on the wing during the spring evenings. In the preceding part of the blog Chris and Conrad described how they set up malaise and bottle traps in a section of forest. How did these fare? 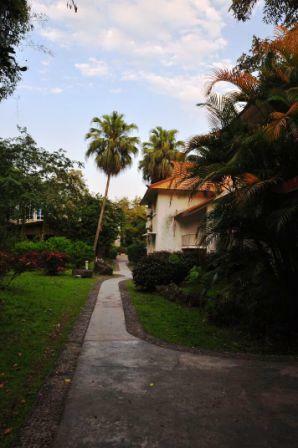 “On our final morning at the botanical gardens we planned to check the traps we had placed earlier, however before we set off to do so, we had to recover some of Chris’ belongings. He woke at around 6 to a soft thud, and realised in a rather sleepy way that the curtains to his window were open, and protruding through them was a shadowy head and shoulders and what appeared to be a short fishing rod. On being challenged (“WHATDOYOUTHINKYOUARDOING!” – daft question really) the thief fled, leaving Chris’ medical kits spread on the ground outside. Later Chris found a three-pronged fishhook embedded in his computer bag – obviously that was the next target. The slightly tarnished silver lining was that the hotel gave us a £5 discount to acknowledge Chris’ distress and mental anguish. After this little fiasco we were finally able to check our traps. Unfortunately the banana bottle traps were very disappointing and did not yield any beetles except for some pollen beetles (Nitidulidae), which are a staple in such traps. We had hoped for some weevils including some belonging to the family Dryophthoridae, which can be successfully collected on banana. 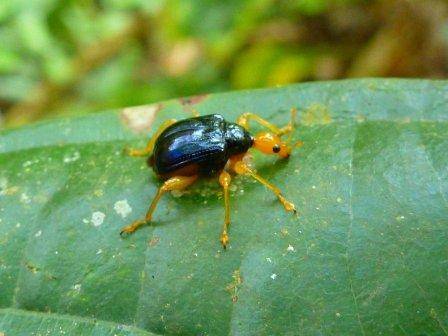 However, whilst none came to our traps, we did find the pest species Cosmoplites sordidus on cut banana plants nearby. The malaise/flight-interception combo traps were a little better, with perhaps seven different species of weevils captured (Molytinae, Rhyncophorinae, Anthribidae and Dryophthoridae) as well as quite a lot of bark beetles (Scolytinae) caught in the trays of one trap set on the edge of the forest – some of these specimens were so small that it looked like they could have flown through the mesh of the malaise trap without touching the sides! 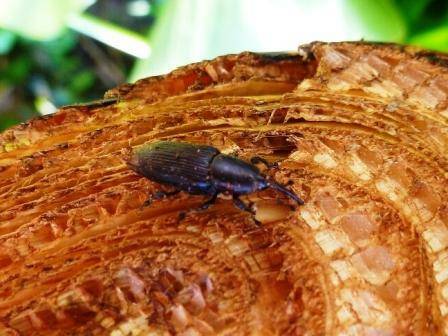 Bark beetles are indeed weevils according to most systematic studies, though at a casual glance they look nothing like a ‘standard’ weevil, especially because they lack a prolonged rostrum and are usually cylindrical in shape (a common adaptation taken on by many wood-boring beetles). Chris and Conrad, together with Ren Li, their colleague from Beijing, were then driven to one of the very southernmost tips of China, right on the frontier with Myanmar to the West and Laos to the South and East, to continue their collecting activities in this region.“Our next base was in the town of Mengla, very close to the border with Laos on the eastern edge of a southern-poking extension of Yunnan. 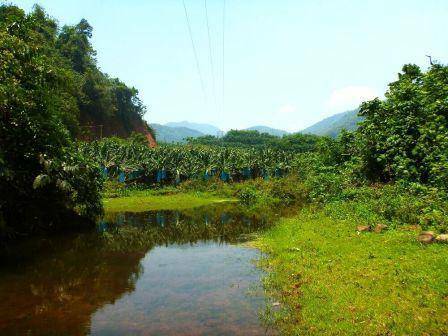 We were rather hoping that this region would be as humid as the area around Menglunzhen, or that at least the rains would follow us on our southbound route, but in fact the hilly terrain in this completely tropical part of China was once again rather dry. 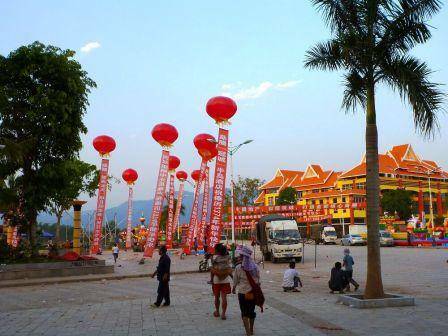 Our arrival in Mengla coincided with the first day of the town’s most important annual local festival, loosely translated as the ‘festival of splashing water’, meant to celebrate the coming of the rainy season and as significant as our own New Year’s festivities. We were warned by Ren Li that the festival, lasting for several days, would indeed entail a certain risk of being dowsed in water by the locals, and we prepared accordingly by placing wallets, cameras and passports in plastic zip-lock bags in anticipation of a soaking! That evening after dinner, we were drawn to a firework display and musical extravaganza taking place near our accommodation, but thus far the crowded festivities proceeded without any obvious ‘splashing’! In fact as it turned out the festival of splashing water was something of a damp squib in this respect! The only evidence we came across of its intention were some burst water balloons on the streets the following day - evidently we had missed the main event! Perhaps here too a ‘hosepipe’ ban had been enforced due to the unseasonal dry weather, just as we had heard had happened in parts of Britain! From Mengla we made daily excursions into the hills, collecting in gullies, along roadsides and off the vegetation lining river- and stream-sides. 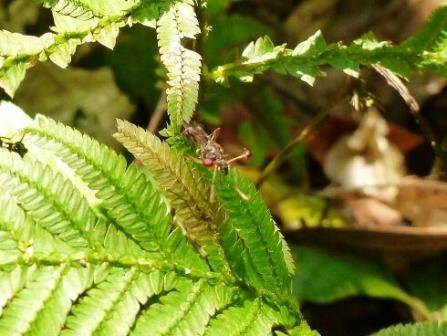 We also had a particularly good day’s collecting at the edge of a forested area where we could also access a riverside. 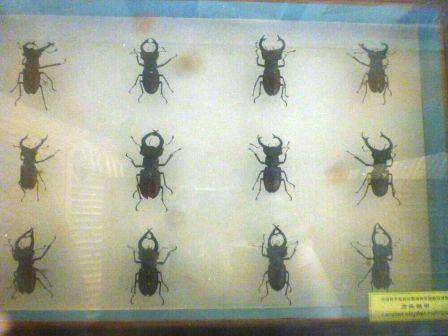 Here a wide variety of weevils were found including at least three species of the subfamily Curculioninae (including a small orange species that upon first impressions is quite baffling), a cryptorhynchine and more Molytinae and Entiminae, plus the occasional baridine to name a few. A species of black Apionidae that we had been collecting almost everywhere else, seemed to actually be absent from this area though! 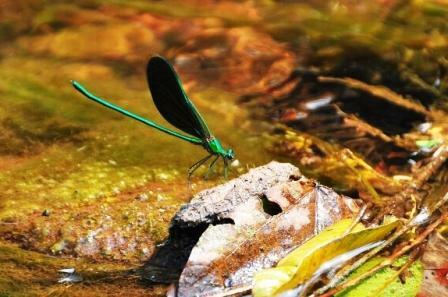 Of other insects, we came across a wonderful selection of damselflies and dragonflies (Odonata) at the streamside, including a gleaming emerald damselfly and a smart jet-black species. 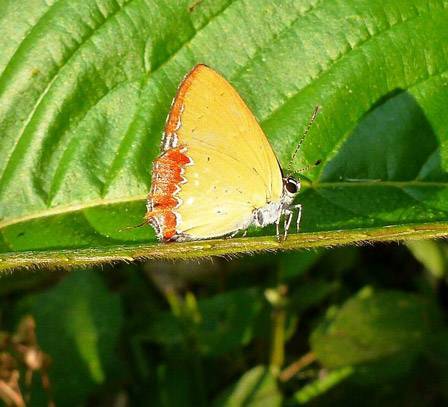 Other interesting sights included stalk-eyed flies, more butterflies, including a lycaenid with exceptionally long ‘tails’ on its hind wings and a wide variety of crickets and colourful bugs – the latter often represented by flamboyantly coloured, rectangular-shaped nymphs. 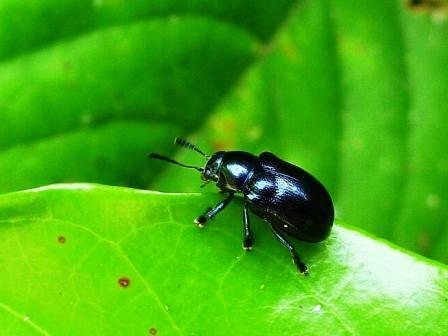 Other beetles seen included more leaf beetles (Chrysomelidae), various species of Languriidae, the odd longhorn (Cerambycidae) and an interesting persity of the family Lagriidae, which has only a single representative in Britain. Conrad made the fortuitous discovery of a cow-pat (the sight of livestock is quite rare here), which brought out the scarabophile in him, and a good old poke-around for dung beetles proved irresistible! This yielded a species of ball-rolling Paragymnopleurus and a horned Liatongus (Scarabaeinae) in burrows underneath the dung. After a day in the field, what does the field entomologist get up to in the evenings?“We all normally meet up to have dinner at around 7pm, which is late by Chinese standards, as most people seem to eat at around 5 or 6pm. Sometimes a quick visit to a local market or supermarket proved most educational (you can really learn a lot about a culture this way!). It is apparent that there is a real penchant here for vacuum-packed assorted animal parts. Some are readily identifiable morphologically (e.g. chicken feet), others requiring further analysis beyond the scope of our present work. 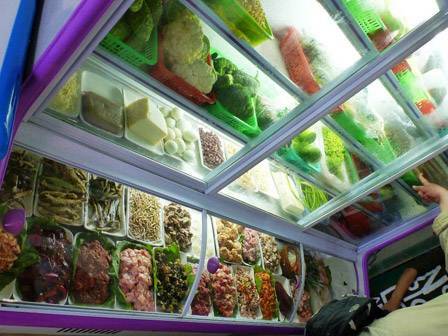 Also interesting is that most of the local eateries do not have a menu to select from as such, but rather you choose your meal from a large fridge displaying all the ingredients on offer (vegetables, mushrooms, various meaty things etc.) – it seemed rather haphazard, but the vast majority of times we were presented with tasty dishes! On one occasion a tray of caterpillars lay among the various items on offer, but despite the almost unbearable temptation to try them out, they proved to be too expensive for our fieldwork budget. We can’t properly express in words our utter disappointment. 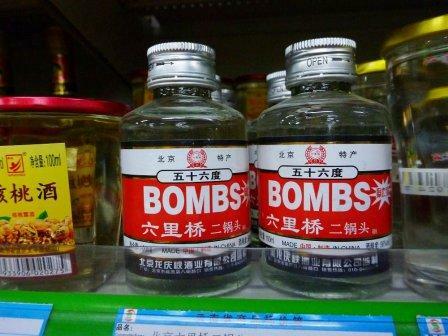 One interesting item found in a local supermarket! 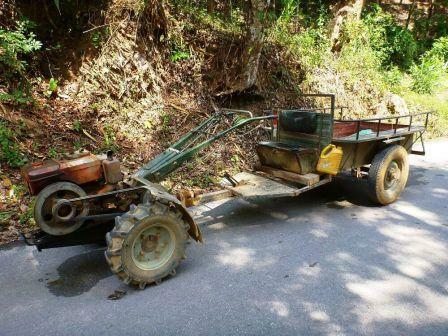 One of the most common modes of transport in rural Yunnan – basically a hybrid between a lawnmower and a horse-drawn cart! “Our final night’s sleep in Mengla was to be rudely and repeatedly interrupted by the loud snorting and grunting noises from two truckloads of tightly-packed pigs that had been courteously parked directly outside our bedroom windows. 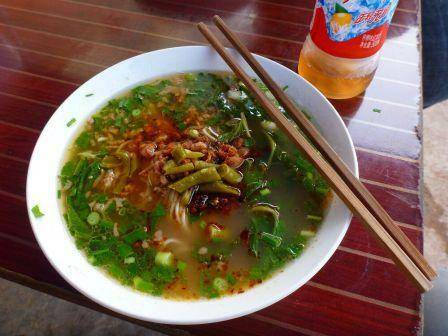 We awoke to the hotel lobby smelling like a pigsty and our breakfast seeming decidedly unappetising that morning, especially as it consisted of rice noodles with pork (the staple morning fare in these parts)! As soon as Chris had paid for the hotel and received a wad of receipts as thick as two short planks (receipts are given as separate sheets of paper for each note of money used as payment!) we set off on our last day of collecting which would take place on the drive back to Jinghong (the main city in Xishuangbanna) from where we would be flying back to Beijing the following day. Our last day’s collecting proved to be one of the most successful for weevils, and each site visited produced additional specimens. 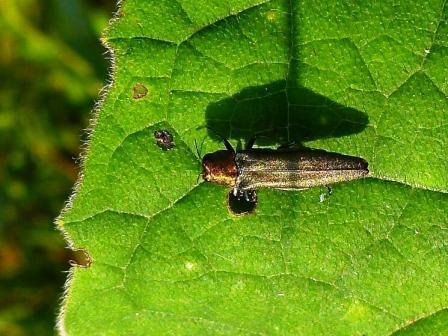 At the first site more Curculionini, Entiminae and Attelabidae were collected and a few other beetles were spotted including an Agrilus (Buprestidae) warming itself in the early morning sun atop leaves. 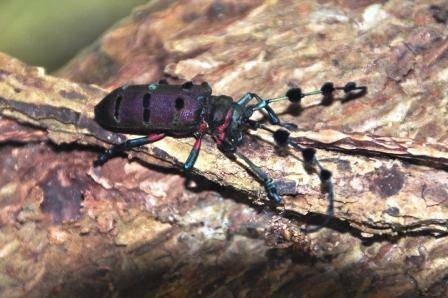 The second site consisted of many felled trees and was not as productive for weevils as we had hoped although Chris found the gaudy longhorn beetle Diostocera wallichi (Lamiinae). 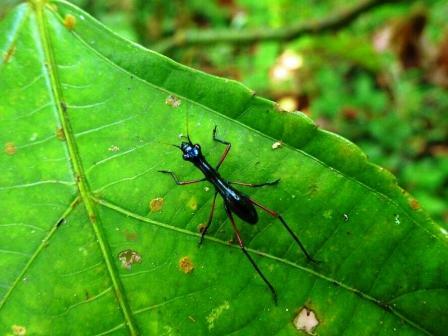 At the next site, Conrad caught what he at first took to be an arboreal tiger beetle of the genus Tricondyla (Cicindelidae). However just before the specimen was captured Conrad noticed that its behaviour was not quite right – it wasn’t fast enough! And the antennae were too long and too fine to belong to that of even a dainty tiger beetle. The specimen was in fact a marvellous orthopteran mimic of the tiger beetle, and surely amongst the finest of insect ‘mimics’! 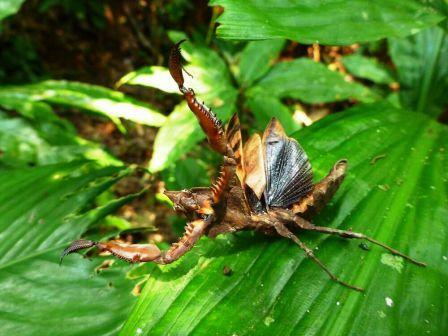 Here the plot thickens because it is thought that Tricondyla itself is a mimic of large ants, prompting us to rethink exactly who is the mimic and who is the mimicked in the dark underworld of insect deceit! 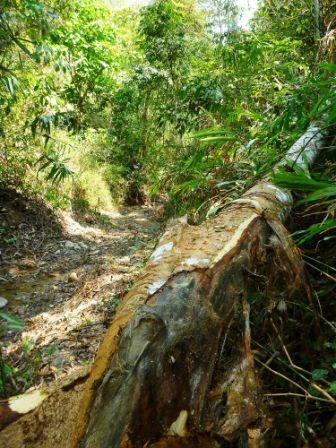 The final gully we visited was also one of the finest, with an easy-to-follow trail through the humid rainforest, where giant yellow and black swallowtails darted through the clearings and large praying mantids made their ferocious threat displays. 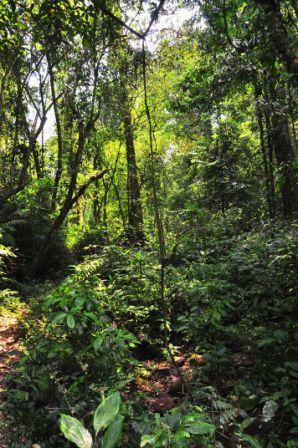 Many weevils were collected here belonging to several subfamilies, including a range of small species beaten from low vegetation at the entrance to the gully and attelabids perching on the surface of leaves. Inevitably, our final sweep, last ‘poot’ and Chris’ brief ceremony of throwing his trusty beating stick (that had lasted a full two weeks) back to the forest, heralded the culmination of our collecting in Yunnan. The tops of the last tubes were twisted shut and we headed to Jinghong and our final crossing of the Mekong river as the early evening sun sank ever lower. 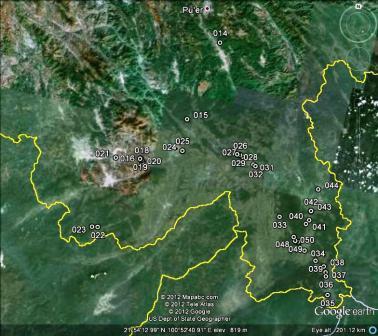 The following day we thanked and bid farewell to Yang Kun, who had so ably driven us to a total of 36 collecting sites in Yunnan (shown on the map), and we prepared to board our flight to Beijing. But one final near-calamity awaited us. As some of our check-in luggage had become overweight, some packing redistribution had to be performed at the check-in desk, during which a baggage combination lock was dropped on the floor before being used to lock Chris’ cabin bag. Subsequently as we passed through the baggage scanner on the way to our departure gate, a suspicious dark metallic object was identified in Chris’ bag and he was requested to allow the airport security officials to investigate inside. Stay tuned for Chris and Conrad’s final blog post detailing their visit to the Institute of Zoology at the Chinese Academy of Sciences in Beijing.